Maintain safe access to potable water with heated hoses. 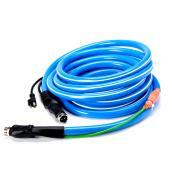 These heated water hoses can be up to 25 feet long and are made with FDA-approved PVC. Each hose is thermostatically controlled and maintains efficiency at temperatures well below freezing. Combine these items with heavy-duty utility buckets to get clean water to livestock and plants. The hoses also feature end-to-end grounding for added safety. Prepare for cold weather with our selection of hoses and other farm accessories.